Research from http://www.reallymoving.com the UK's leading provider of instant online quotes for home-movers, shows that the cost of moving has increased by 85.4% in the past three years. 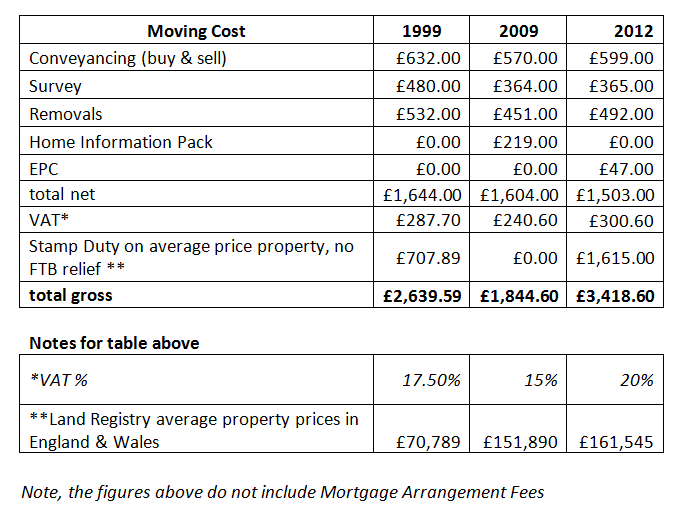 Average cost of moving home £1,574 more than 3 years ago. The overall cost of moving is still lower than in 1999. However, it is of little comfort to home movers that the Government imposed taxes have made moving home significantly more expensive over the past 3 years. Research from http://www.reallymoving.com the UK's leading provider of instant online quotes for home-movers, shows that the cost of moving has increased by 85.4% in the past three years. In October 2009, the average cost of moving was £1,844.60. This included the price of a Home Information Pack, but there was no Stamp Duty Land Tax on properties under £175,000 at the time and VAT was only 15%. Land Registry records show that the average property price in England and Wales in 2009 was £151,890. b) the VAT rise to 20%. Interestingly, the price of Moving Home services have not increased significantly in the past 3 years and many of the fees quoted are lower than 1999. In 1999, 1% Stamp Duty Land Tax was payable on properties priced between £60,000 and £250,000. In 2009, all properties priced under £175,000 were exempt from Stamp Duty Land Tax. In 2012, properties priced £125,000 - £250,000 incur Stamp Duty Land Tax of 1%. All other data compiled from quotes generated by reallymoving.com in 1999, 2009 and 2012. Prices are excluding VAT which is added separately according to the current rate. The figures are based on over 80,000 registrations each year. Reallymoving.com moving cost dataShocking 85% more expensive to move home now than in 2009.